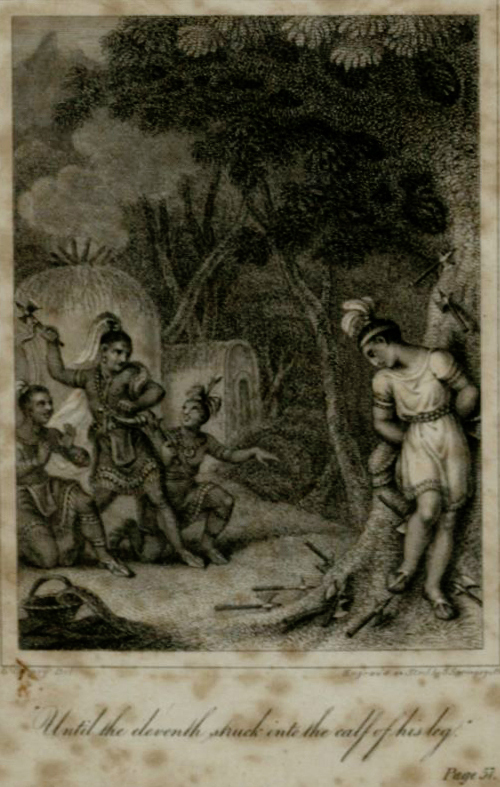 Illustration depicting native children throwing tomahawks at Manuel. Image taken from The Stolen Boy: A Story, Founded on Facts. The Stolen Boy: A Story, Founded on Facts: Written by English author Barbara Hofland and published in approximately 1830, this popular captivity narrative recounts the Comanche capture of Manuel del Perez near San Antonio. The volume describes his life among the natives for three years before his eventual escape and reunion with his family. Herman Lehmann dressed in Comanche war garb. Image taken from Nine Years Among the Indians, 1870-1879. Nine Years Among the Indians: Herman Lehmann, son of Mason County, Texas, German pioneers, was captured by the Apache when he was 10-years-old. His life with the Apache, and later the Comanche, had a great impact on him. When he was forcibly returned to his family in 1878, he no longer remembered them or the German language. His adjustment to white society was difficult. He considered himself to be native, maintaining contact with the Comanche for the rest of his life. 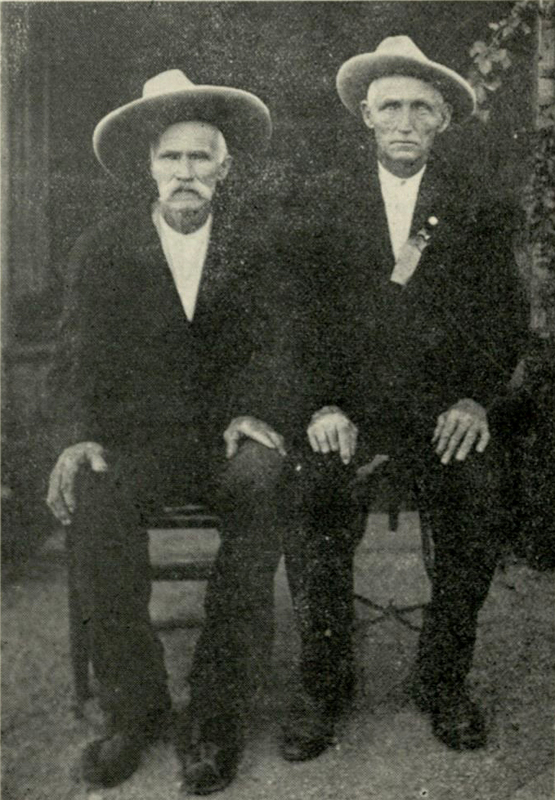 Clinton and Jefferson Smith in 1927. Image taken from The Boy Captives. The Boy Captives: Perhaps one of the best known Texas captivity narratives, this volume recounts the story of Clinton and Jefferson Smith who were captured in 1871 near their home between San Antonio and Boerne at the ages of 11 and 9 by a group of Lipan and Comanche. Rescue attempts to reclaim the children were futile, and the boys remained captive for five years before returning home. Their story was widespread and the Smith brothers later enjoyed fame as frontier celebrities. The above volumes are but a small sampling of captivity narratives available in the collection. These volumes are ripe for research and provide unique insight into pioneer life. Hofland, Barbara. The Stolen Boy: A Story, Founded on Facts. London: J. Darling for A.K. Newman and Company, 1830. Print. Lehmann, Herman. Nine Years Among the Indians, 1870-1879. Austin: Von Boeckmann-Jones Co, 1927. Print. Rowlandson, Mary. Narrative of the Captivity and Restoration of Mrs. Mary Rowlandson. Project Gutenberg. Web. 12 April 2014. Smith, Clinton L. The Boy Captives. Bandera: Frontier Times, 1927. Print.